A Casa di Olivo i Firenze, Italien: Reservér nu! The house has been obtained by an ancient dwelling place of the Medicean age that, during the time, has given hospitality to several generations of peasant families totally committed to farming and cattle breeding. While the inside of the house has been finely renovated, keeping however the original country look of the structure, the outside area has been kept unchanged and the neighboring fields are still cultivated as in the past. 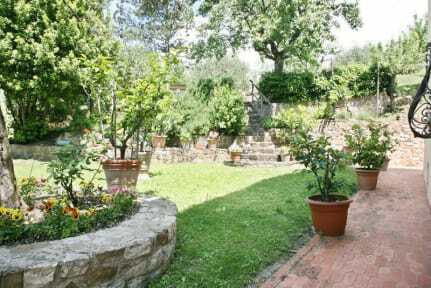 As a matter of fact the farmhouse is surrounded by a nice garden equipped with barbecue where you can eat and relax, and also by a beautiful olive grove where you can walk. 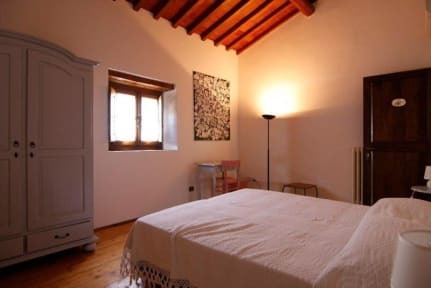 The house is located very close to downtown where you can visit and enjoy some of the most important and famous monuments and museums of the world such as the cathedral with the gorgeous Brunelleschi dome, the Giotto bell tower, the Palazzo Vecchio, the Old Bridge, The Uffizi museum and many others. In addition it is available very close a big shopping center, a riding school, tennis courts and an important fitness center (Virgin Active) where you can find a gym, a swimming pool and a spa. Further to the above, from the Bed & Breakfast you can easily reach in half an hour by car or by train the historical town of Siena and Arezzo as well as the charming hills of the Chianti area, of the Mugello and of the Casentino area. The kitchen is located in the ground floor and is equipped with oven, dishwasher, microwave, fridge and cooking surface. From the kitchen you get directly to the dining room and to a wide living room with fire place from which you can go directly to the forecourt. At the basement level there is a small cellar where typical Tuscan wines and food items are kept. Laundry is outside with an open space where you can dry linen.